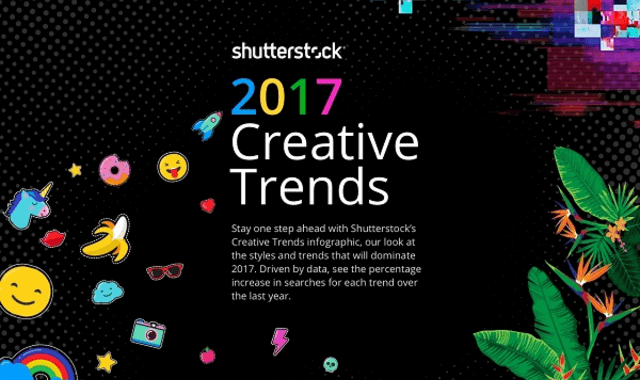 Explore Shutterstock’s Global Creative Trends That Will Shape 2017 #Infographic ~ Visualistan '+g+"
Stay one step ahead with Shutterstock’s Creative Trends infographic, our look at the styles and trends that will dominate 2017. With information gathered from billions of searches, plus expert knowledge from our design, video, and music teams, we show what’s on the rise around the world. Are you a time-traveler? In order to remain relevant in industries that change in a moment it’s imperative to keep your images and design elements in tune with the coming trends. Unless you’ve got your hands on a time-travel machine correctly predicting them can seem impossible. So how do so many brands continue to nail their image and their digital content year after year? Through old-fashioned math. Look no further for a comprehensive breakdown of the creative trends that will shape the globe in 2017 – Shutterstock has put together a breathtaking infographic with all of the relevant information your company needs to succeed. From design trends to video trends to music trends, no creative field is left untouched. With their vast collection of current photographs and images, Shutterstock can see – literally – what’s relevant now and what’s about to be relevant. Read below for the trends sure to define 2017. Learn about the trends below, then view the entire interactive 2017 Creative Trends Infographic.